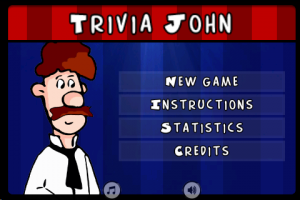 A new fast-paced trivia game for your device. Play a “Full match” (alone or against a friend – sharing a single device at the same time) or just a “Two Minutes” or “First Error” session, testing your knowledge in one of the three available themes (music, literature and movies). Each theme contains thousands of informations that the app will use to build a huge number of different questions, and it comes with three levels of difficulty (easy, normal and hard) to let you tune the game depending on your skills. – OpenFeint/GameCenter support so that you can check how good you are, compared to your friends or other players all around the world. – gui & questions databases in English or in Italian language (selection is automatic, based on your device international settings).